It's hard to go to Hawaii and not commune with nature. However, there are some really great things you can do to immerse yourself even farther instead of sticking to the white, sandy beaches. 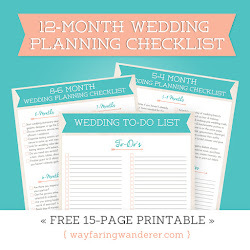 My favorite way to do this is by taking a hike! 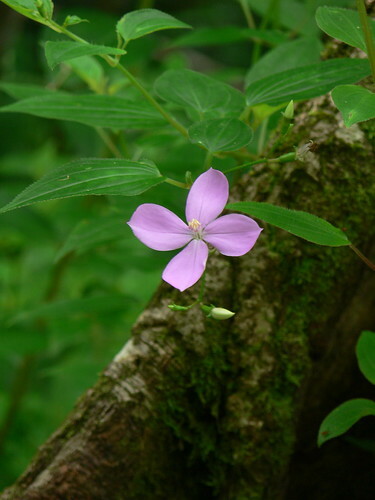 The island of Oahu is riddled with trails if you know where to look, but there are two trails in particular that get all of the praise. So popular, in fact, that these outdoor adventures can see hundreds of tourists everyday! 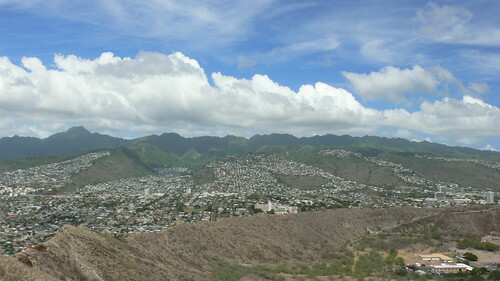 The two favored hikes in Honolulu are very different from one another in the realm of landscape and atmosphere. Now, two hikes in one day may sound like a bit too much, but I chose to do so because they were very close to one another. And since I was staying on the other end of the island, I figured I should hit them both up on the same day. My first stop was the Manoa Falls trail located just outside of Honolulu in Manoa Valley. I am a sucker for waterfalls, so I had to get a glimpse of this 160-foot tall mammoth. Since this unbelievably lush rainforest was deserted at this hour of the morning (7:30am), I decided that I would forgo taking pictures until I reached the end only because I thought that it would stay that way. 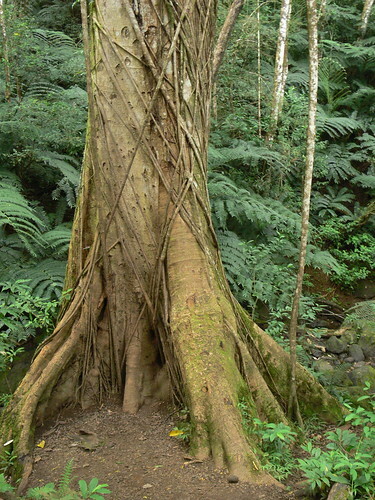 I walked amidst the gigantic Banyan trees flanked by the everpresent stream. 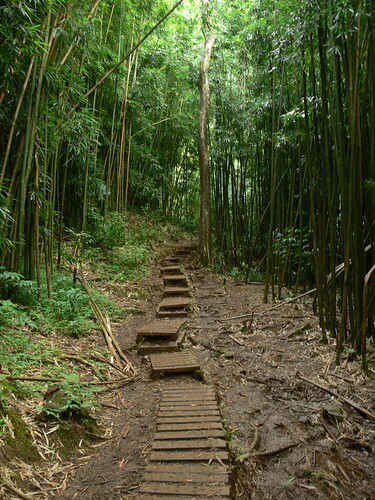 As I made my way up the narrow pathway, portions of the trail were framed by bamboo forests. I found this trail to have a very gentle grade, and at only 1 mile each way, it's one almost anyone could undertake. One thing to be careful of on this particular trail is the mud, because it can be slippery! It receives quite a bit of rain from what I have read, although maybe it hadn't rained much lately, because the cascade was meager. It wasn't too terribly disappointing though, since it took little effort to get there. Parking, however, is not! I didn't find this out until I got back to the Jeep where a little yellow note asking me to see the attendant regarding payment was stuck to my window. Be forewarned that they charge $5 to park in the parking lot at the trail head. I got away with only paying $2 because I claimed stupidity. Sucka! Seriously, though. I didn't see any signs that said there was a charge, and I certainly didn't overlook an attendant! 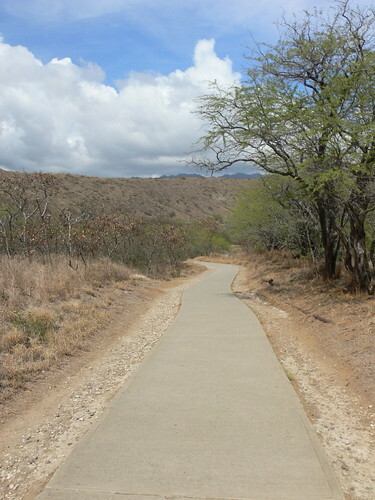 The next stop, Diamond Head Crater, is considered the most popular trail. 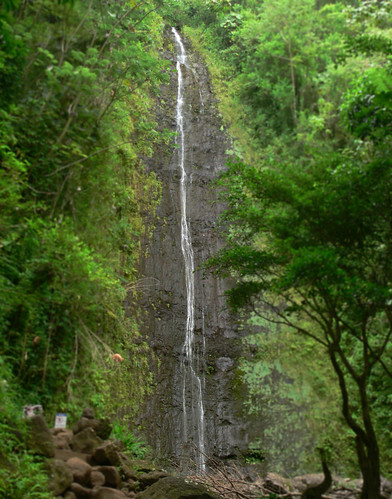 It likely sees twice the amount of hikers that Manoa Falls does. Unlike the gentle grade of the last trail, this one is much more vigorous. Even though you start off on a concrete path that seems forgiving, it quickly morphs into switchback city! 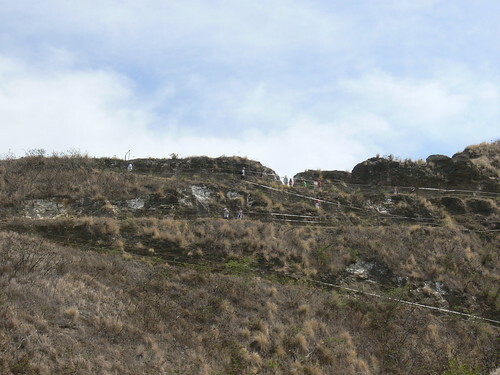 From the crater floor to the summit you will climb 560 feet in less than a mile (0.8 to be exact). By the time you weave your way through the switchbacks, you are begging for mercy as the sun is blazing and the sweat starts pouring. It would do you good to be very well hydrated before attempting this trail unless you are a fan of fainting. 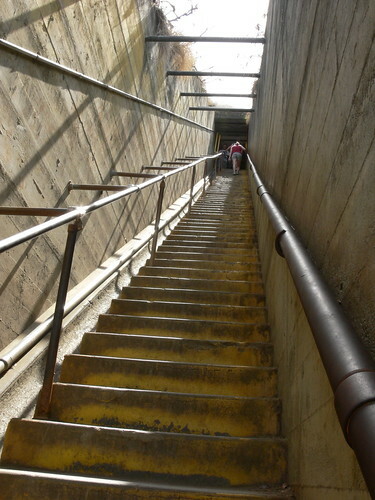 You begin to think that the worst is over, but that's when you are met with a steep concrete stairway consisting of 74 steps! Afterward, you get a chance to cool off in the tunnels that take you below the surface. The closer you feel to the top, though, the further away from reality you are because after stepping out of that dark tunnel, you are standing at the foot of yet another staircase! Some just stood there, mouth agape, staring in disbelief at the towering approach. More steps!?!? Yes, 99 of those bad boys :D And just when you think you can't take another footstep, they make you climb a spiral staircase!! I suppose that this trail wouldn't be so popular if the views weren't worth every drop of sweat shed along the way. The vista was most definitely a stunning sight with the Pacific ocean and Wakiki coastline in full view. As a matter of fact, this is an ideal spot to see a panoramic view of the Leeward side of the island. Your photography + Hawaii = magic!! wow - you're a better climber than me. I couldn't have done it. spectacular view though. beautiful shots. What an adventure -- I'm officially jealous. And i love shots of stairways and paths! Nineyseven...nineyeight...nineynine... oh you gotta be kidding me! you are gorgeous and so are your photos. the parking story reminds me of one I heard recently (I think from Britain) where a guy had been dutifully collecting parking fees for many many years, turns out he didn't work for either of the two companies that people thought he worked for, each thought he worked for the other. He made loads and loads of money before he disappeared! fabulous shots- of an equally fabulous place!!! Fabulous shots! I have been to that waterfall! I love the photos of the steps and pathway! Beautiful captures! my, that is such a super pretty view! and of course a beautiful model adding the credits. you look great! and the view is amazing! great photos and yes, despite it sounding difficult that hike would be just what i need today! Definitely took me back reading your post. 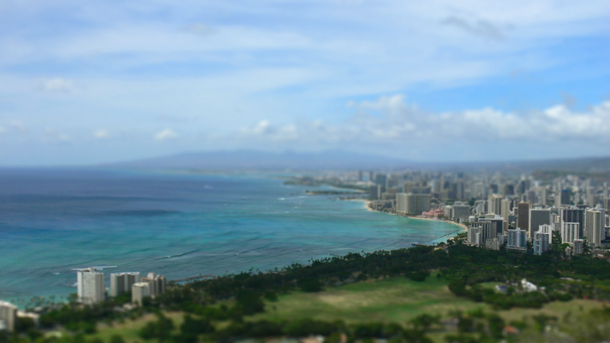 Great pics of the Manoa and Diamond Head. Nice photos, especially the one with you smiling and the Hawaiian beach resort in the background. That was a lot of steps to climb. I am glad the view was worth it. All your holiday pics are amazing. imagine how her feet were killing her!!! Wow nice view! !Hawaii is one of my favorite place and I love being there.I had been there in 2008 and I enjoyed a lot. 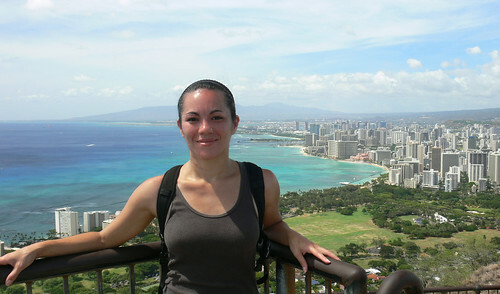 Great blog - I'm headed to Hawaii in Feb. and would love to try out these hikes! Thanks for posting the info. I adore Oahu. I can't believe I missed all those beautiful things while I was there, though I did do Diamond Head, got the shirt to prove it :). Seriously though, I am going to check out the rest of the series but I have to say snorkeling in Hanauma Bay was the highlight of my trip!